Skilsaw is using STAFDA 2018 as a launchpad for the new Skilsaw Worm Drive Miter Saw. Yep, they put a worm drive on a miter saw. Many of us in the office have been wondering if they would target this tool since the introduction of their portable and heavy-duty worm drive table saws. We use the heavy-duty model as our primary model, in case you’re wondering. Editor’s Note: As a very early article, the original release on October 26 was incomplete. We’ve updated the article now that more information is available. This is a 12-inch, dual bevel sliding miter saw that covers an impressive 4 x 14 cross cut at 90°. It bevels 48° left and right. It will have stops at all the common points on the bevel and miter as well. Skilsaw goes with an LED shadow cutline indicator – a move that I prefer over lasers that need calibration. Skilsaw is using one of their 15-amp Dual Field motors. We expect a 15-amp motor on any 10- or 12-inch miter saw, so that’s no surprise. Skilsaw Dual Field design claims to help keep the motor cooler, giving it a longer life and reducing the risk of overheating. That motor spins the blade at 4000 RPM. With worm drive gearing I expect to find some additional torque, but we’ll have to wait until we can make some cuts to know for sure. Skilsaw is claiming that this saw will be the lightest in its class at 51 pounds. 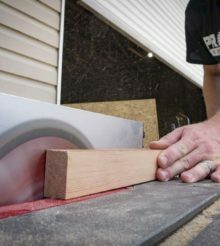 A quick survey of other major Pro brands’ 12-inch sliding miter saws will give you a range of 51 – 65 pounds, so this is definitely about as light as you can hope for. Pro-level dual bevel sliding compound miter saws start around $369 and go up from there. Skilsaw isn’t positioning themselves as a budget brand, and their $579 price tag puts them at the same level as other premium models. Soon, you will be able to outfit the core of your shop with Skilsaw tools. They are bringing it! Their top-end portable table saw is a wonder at a great price. Love what I’m seeing coming out of Skilsaw under new ownership…bring it on! What’s the advantage of a worm drive in a miter saw?